Sunday dinner was all about comfort food. I made smashed potatoes which I find much lower maintenance than mashed potatoes. I just boil some chopped red potatoes with a few garlic cloves and a bay leaf, then remove the bay leaf and smash the potatoes and garlic with some butter, a little salt and pepper and about 3 tablespoons of cream cheese. I also had to use up a few calabacitas I had in the fridge, so I diced half an onion, 2 calabacitas, a yellow squash and 2 roma tomatoes and sauteed them in a little olive oil and red pepper flakes. I added a few cups of sweet white corn kernels towards the end. And the main course was My Momma's Salmon Patties. This recipe has been around forever. When I was a teenager and had braces, whenever I would get the bands tightened and my mouth was sore, Mom made salmon patties and mashed potatoes. This makes me laugh because I know my Mom never measured ANYTHING- so I don't when I make these. Drain and debone the salmon; set aside. Mix 1/4 of the can of soup, the oatmeal, the onion, the egg, the lemon juice (she probably used bottled- I used fresh) and the drained salmon. Make sure to blend all ingredients well. Make small patties and roll in cracker crumbs. Fry until brown. I used panko bread crumbs instead of cracker crumbs. I also formed the patties and put them in the ice box for about 30 minutes to firm them up and help them hold together better in the skillet. I also used a little olive oil instead of butter flavored crisco. You can make a sauce out of the remainder of the soup, the milk and the mayo. I used yogurt instead of mayo and added a shot of vermouth at the end to kick it up a bit. We are almost in the comfort food time of the year again. I just love it. Thanks for the tip on the smashed potatoes. I bet the garlic gives the potatos a lot of flavor! 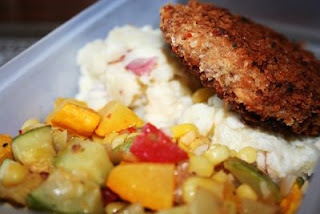 I haven't had salmon cakes since my Memaw was alive. I loved hers, but I haven't a clue how she made them. I'm keeping your recipe. You're the first blogger I've seen cooking them up. I'm glad you did.